When building n-tiered services, the Single Responsibility Principle (SRP) appears to violate the Don’t-Repeat-Yourself (DRY) Principle. This can best be seen when comparing an OData/Entity-Framework service and a more traditional service. 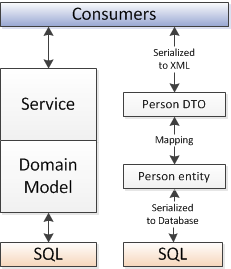 In a traditional service, to expose a Person entity, at the service layer a Person DTO entity is created which will expose the desired Person entity properties to consumers. In many cases this leads to code duplication as seen below. This appears to violate the DRY principle! 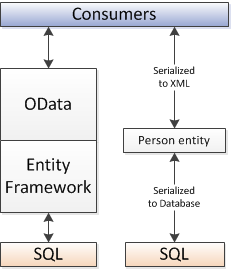 Enter OData and the Entity framework. No longer are DTO objects which duplicate entity properties required. Entity objects are directly exposed to consumers! A change in requirements of consumers. A changing in design from SQL. This violates the Single Responsibility principle. The person entity now has two reasons to change. So how do we satisfy the DRY and SRP principles? A closer look at the traditional service is required. Below is an expanded set of Domain and Service classes. Now the Person entity contains private information which we don’t want to expose outside of the service layer. No longer is the PersonDTO duplicating all the functionality of the Person entity. Similarly, an additional entity, the Animal class, has been added to show that although there are duplicate properties between the classes, the code is duplicated to serve different purposes. Each class represents a different function of the system. Modelling the Animal and PersonDTO classes as a single class would be poor design. Conversely, having a Person and PersonDTO does not violate the DRY principle. This entry was posted in Architecture and tagged .Net, C#, Entity Framework, OData. Bookmark the permalink.